According to E.V., the Mardicas served as a sort of wall to protect the people of Maragondon from the attacks of the Moro pirates, and in return for their services their Santo Nino was taken away from them. There are other miracles Santo Nino had done for the people of Ternate and for who are devoted those who regularly frequented the place to venerate the image. It is believed by many people of Ternate that they will be celebrating the town fiesta every January 5 and 6 of the year, to no surprise, they are able to earn something for their preparation. Seemingly they can easily find means for their foods and other needs for the celebration. It is likely some blessings come to them because of their devotion to the Santo Nino. A blind woman used to go to the church almost every day to kiss the image of Santo Nino. She was always accompanied by her younger son to go up to the main alter. After kissing the image, she used to rub her fingers to her eyes. She did not cease doing it until eventually she was able to see clearly. What is nice also after miracle is that the woman became healer. In another story, there was a man who was already so despair because he succumbed to a severe decease that none of the many physicians he had consulted with could detect his sickness. In the first place, he never believed with quack doctors or with any healer, but many of his sympathizers insisted and convinced him well to see anyone. So upon the advice of the “albularyo”, he went to a church and stood at the gate, praying fervently to Santo Nino. It was like a bubble in space, thus sickness was instantly healed. There was also a woman saying that she never believed with the miracle of Santo Nino unless the image can prove it for itself because, according to this woman, the image has two eyes but can’t see. It has two ears but can’t hear; it has two feet but can’t walk; and the entire body can’t move at all. The woman coincidentally gave birth to a baby girl who looked like the image of Santo Nino and it so happened the child until she reached the age of nine, was totally deaf, mute, can’t walk and can’t talk. A man who is already in the mid-fifties never enters the church. He said he doesn’t think of it since he also prays to Santo Nino even at home. It doesn’t matter to go to the church to offer prayers. Anywhere can do, according to him, one Sunday morning, he found himself inside the church to hear the mass. While there, unexpectedly, he shouted in the wilderness, saying “Santo Nino, you guide me! I need you, Santo Nino!” Everybody in the church was so astonished with his behaviour and gesture. Almost the whole period of the mass, he was shouting, and praying until after the mass, he walked out of the church usually, and now this man helps healing the sick. 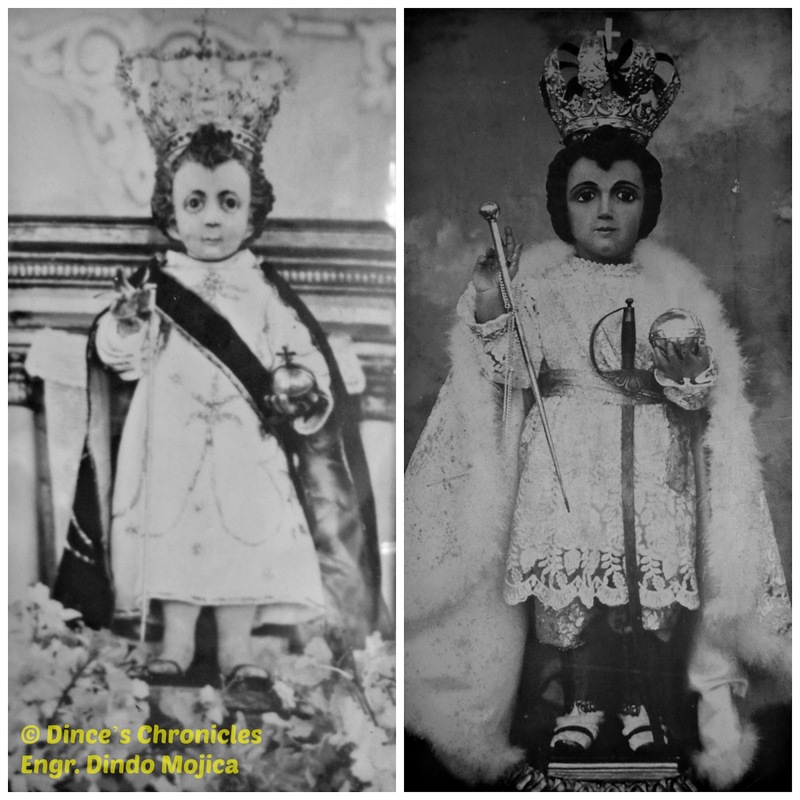 In another dream of the author (Dr. Evangelino Z. Nigoza), Senor Santo Nino was seen likely to stumble from where he was standing. The author quickly approached Nino to rescue him from that condition. Nino was about to whisper something to the author when all of a sudden the personal driver of the author shouted and asks what is Nino whispering. In less than two weeks, it so happen the sister of the author who was very active in the church, got stroke and was paralyzed. Someone told the author that was perhaps the “message” of Santo Nino. In 1965, the parish priest invited the author to come inside the convent to see the footprint of Santo Nino on top of the glass casket placed at a private room. The author remembers that one time the priest told him that miracles are not true. He said that it is hard to believe with what others say about miracles but upon seeing those footprints, his devotion to Santo Nino deepens. In a big razed near the town plaza in year 2000 after the feast day of Santo Nino, miracurously, the house of Eduvihes, Tiyang Beheng to everybody, was not gutted despite this is made of “buho” and bamboos for over 13 years already, and only a foot away from the house where the fire started. Tiyang Beheng at her age of 80, almost like a fly flying swiftly from her house to the nearly church and prayed hard to Santo Nino then she came to know that her house survived but her neighbors’ get burned from that fire. When she opened her eyes, she was surprised that she was already at her home, crying and thanking Nino for her survival. For many times already, Santo Nino had visited a certain individual or family from such places. Nino visited them in the appearance of a little boy, telling them to go to Ternate and visit the church. These people, when they get inside the church, are surprised that the image of Santo Nino at the altar is the same boy who talked to them. To know more about the History of the town of Ternate, to learn the Ternateno Chavacano dialect, the Arts and Literature of the Ternatenos, I suggest you may buy a copy of the book BAHRA (Book 2) by Dr. Evangelino Z. Nigoza. It is available at the Cavite West Point College in Ternate, Cavite.